Soft-spoken and generously warm-hearted, Jesse McReynolds is the younger and lower-voiced of two brothers who were separated as musical partners only by military service and death. Jim and Jesse performed together, composed together, married sisters (Jesse’s first marriage), and lived in adjoining residences – the Double J Ranch in Gallatin, near Nashville, Tennessee. Jesse’s mandolin virtuosity, strong lead vocals, and gentlemanly demeanor have endeared him to millions of fans over seven decades. Jesse McReynolds grew up in a mining and farming community among the mountains of southwestern Virginia. Seriously injured in an auto accident at the age of 14, he used the time away from lessons and farm chores to develop his musical skills. A new radio station opened in nearby Norton in 1947 just as Jim mustered out of the Army and Jesse graduated from high school. The brothers formed a group to play a 15-minute daily program, and vowed to pursue a career as entertainers. With fiddle, mandolin, guitar and bass, the style they played was known as “mountain” or “hillbilly” music. The term “bluegrass” had not yet arisen, but Jesse and Jim McReynolds were impressed and influenced by the new sounds being made by Bill Monroe, Flatt and Scruggs, their neighbors the Stanley Brothers, and early alumni of those bands. Over the next 14 years, the brothers migrated to more than a dozen radio stations in at least 10 states. Whenever they could get a three-finger five-string banjo player, they incorporated that instrument into their band and recordings. In idle moments during 1949, Jesse experimented with using a flat pick to imitate Hoke Jenkins’ backward bluegrass banjo roll on his mandolin. The style quickly evolved into the first full-blown alternative to Bill Monroe’s mandolin technique. Jesse’s “crosspicking,” the brothers’ distinctive smooth vocal duet (influenced by a brief foray into cowboy music), and a propulsive and dynamic band rhythm immediately distinguished the McReynolds’ sound from all others. A contract with Capitol Records came in 1952, and the group was retitled “Jim & Jesse and the Virginia Boys” (although few of the accompanying musicians who appeared under that name in the next five decades hailed from the Old Dominion). A third and fourth session were squeezed into Jesse’s two-week furlough between Army basic training and departure for the Korean conflict. Jesse drove a jeep in the war zone and played in a five-piece band that also included Charlie Louvin (from the Louvin Brothers, composers of Jim & Jesse’s 1952 release, “Are You Missing Me”). Starting up again in 1954, Jim & Jesse found a musical landscape greatly changed by rock ‘n roll. They survived by promoting their records directly to establishments with jukeboxes, building new audiences in the rural deep South, pioneering bluegrass music on regional television, and lining up sponsors like Ford Tractors, Pet Milk, and Martha White Mills. A dry spell for recording ended with sessions for Starday in 1958 and 1959, then Columbia and its subsidiary Epic throughout the sixties. Jesse’s creativity and broad musical awareness led the group in many interesting directions. In addition to a core strength in bluegrass, the brothers experimented with electric country, Latin, pop, gospel, and an entire album of Chuck Berry songs backed by acoustic instruments – “Berry Picking in the Country” (1965). During the folk music boom, the act played the prestigious Newport festival and college campuses. A worldwide audience was built through appearances in the British Isles, Europe, and the Far East. When bluegrass festivals grew to a reliable performance circuit, Jim & Jesse dropped electric instruments and drums and built their own recording label, Old Dominion. In the CD era, they also recorded for CMH, Rounder, and Pinecastle (Jesse’s current affiliation). Jesse’s son and bass player, Keith McReynolds, contracted multiple sclerosis and died at the age of 44 in 2000. In 2002, both McReynolds brothers were diagnosed with different strains of cancer. Jesse recovered but Jim passed away on the last day of that year. 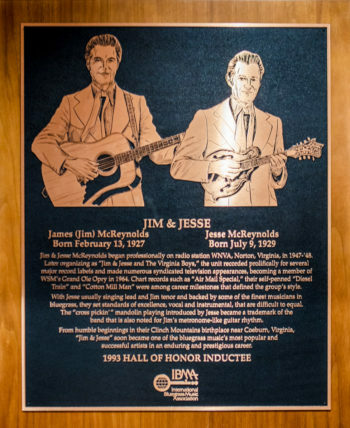 According to Wikipedia, Jesse has carried on the Jim & Jesse tradition and continues to play with the Virginia Boys and Girls. He has recently opened a music park on his family farm in Gallatin, Tennessee, called “The Pick Inn” where he hosts many special events. Jesse’s present band lineup includes grandson Garrett McReynolds as tenor singer/rhythm guitarist. Garrett’s older sister Amanda sings third-part harmony. Sometimes Jesse grabs the historic fiddle his grandfather played on the Bristol Sessions, and lets grandson Luke McKnight do the crosspicking that Jesse invented and made famous. With his musical family Jesse McReynolds continues on, entertaining fans all over the world. Inventor of “McReynolds style” mandolin playing, which few other players have attempted and none have yet mastered. Introduced a smooth vocal harmony to bluegrass, bridging the brother duet and modern country styles. The longest active professional brother duet in country music history – 55 years. Jesse’s grandfather, fiddler Charles McReynolds, recorded at the historic 1927 Bristol sessions as a member of the Bull Mountain Moonshiners. At first, Jim played mandolin and Jesse guitar. When neither was making much progress, the brothers exchanged instruments. A 1954 Capitol Records promotion booklet listed the following details about Jesse: height: 5’8″, black hair, grey eyes, weight: 145 lbs., single, favorite food: fried potatoes, favorite color: blue, favorite sports: fishing, hunting. Toured and recorded as a member of The Masters, a quartet of “superpickers” that included fiddler Kenny Baker, Dobro player Josh Graves and banjoist/guitarist Eddie Adcock. “We grew up in a coal mine section in southwest Virginia… The entertainment we had back then was all live. My father’s brothers all played. My grandfather, Charlie McReynolds, was the fiddle player in the community… You’d walk down through the valley where he lived and you’d hear his fiddle playing." Quoted by Dale Vinicur in liner notes to Jim & Jesse: 1952-1955, Bear Family Records, 1992. Quoted in liner notes to Songs from the Homeplace, Pinecastle Records, 1998. Quoted by Thomas Goldsmith in liner notes to In the Tradition, Rounder Records, 1987.